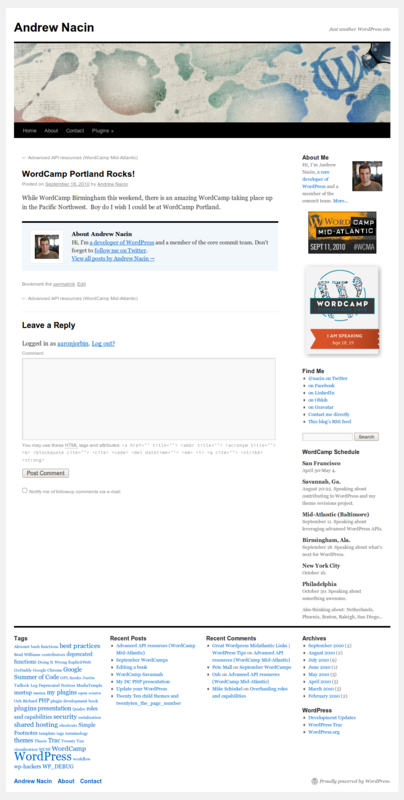 Posted byAaron Jorbin	 September 18, 2010 Leave a comment on WordCamp Portland Rocks! I’m at WordCamp Portland today and tomorrow. I’ll be giving a speech on Building Child Themes: The smart way to develop WordPress themes tomorrow at 4:15pm. If you build or modify themes, this will be a good session for you to attend. If you’re here and want to say hi, I’m the guy wearing a blue and white shirt with a yellow bow tie today. Check my twitter tomorrow to see what I’m wearing then.